The commands are designed to match the Pomodoro Technique interactions. If at any point you forget the commands, type "pombot help." Starts a pom timer for 25 minutes. Displays time remaining in the active pom. Bocoup maintains PomBot as an open source tool. To share your feedback, open an issue or a pull request on the PomBot Github repository. 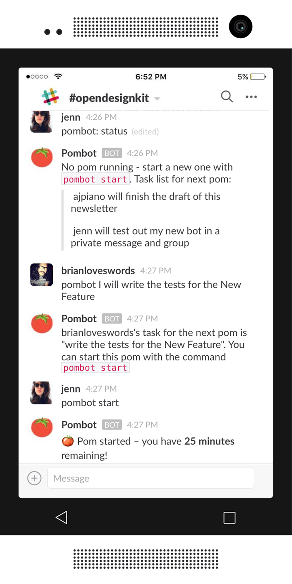 PomBot is powered by Chatter.